Synthetic diamonds display several features which allow them to be gemologically distinguished from natural diamonds. These include visual characteristics such as color zoning, dark metallic inclusions, weak strain patterns and distinctive patterns and colors of ultraviolet fluorescence. Because they represent types of diamonds that are rare in nature, synthetic diamonds also possess additional features that can be detected with gemological instruments. 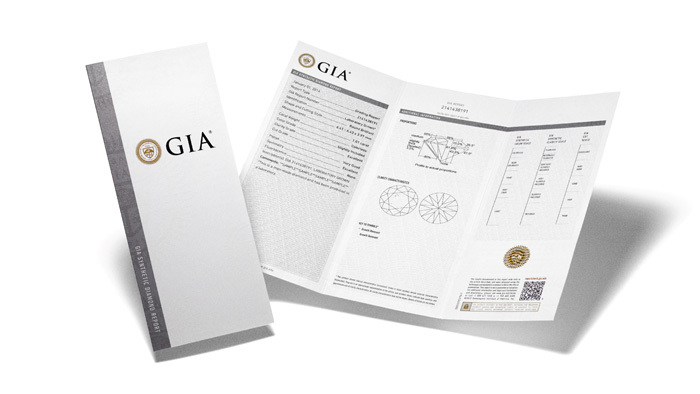 The GIA Synthetic Diamond Grading Report provides the same information as the GIA Diamond Grading Report for natural diamonds, using a more general description of color and clarity with the GIA Synthetic Diamond scales. 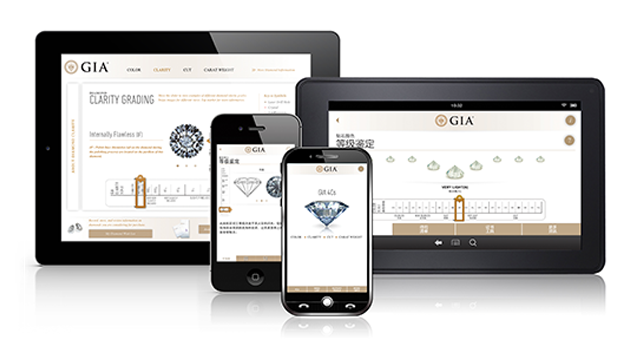 The GIA Synthetic Diamond Grading Report offers the same information as the GIA Diamond Grading Report for natural diamonds, however; a more general description of color and clarity is provided. For added disclosure and identification, the synthetic diamond’s girdle is laser-inscribed with its report number and a statement that the stone is laboratory grown. What’s more, the report itself looks distinctly different from those issued for natural diamonds. The laboratory issues synthetic diamond grading reports for loose, colorless to near-colorless synthetic diamonds that weigh 0.15 carats or more. 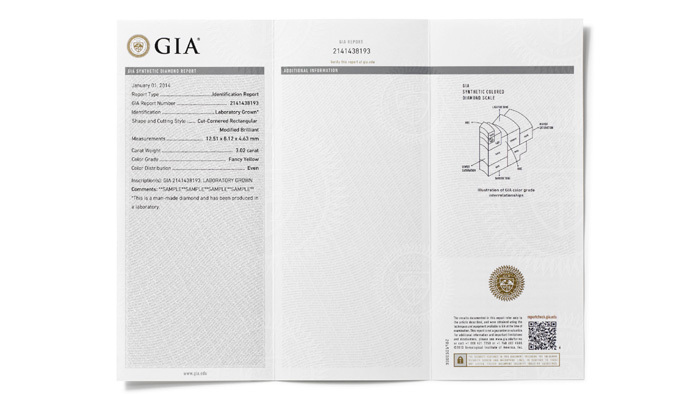 GIA Synthetic Diamond Grading Reports are not issued for simulants, mounted synthetic diamonds or those that have undergone unstable treatments, such as fracture filling or coating. And while synthetic diamond grading reports may be issued for diamonds that have been laser drilled, this stable treatment is prominently disclosed on the report. 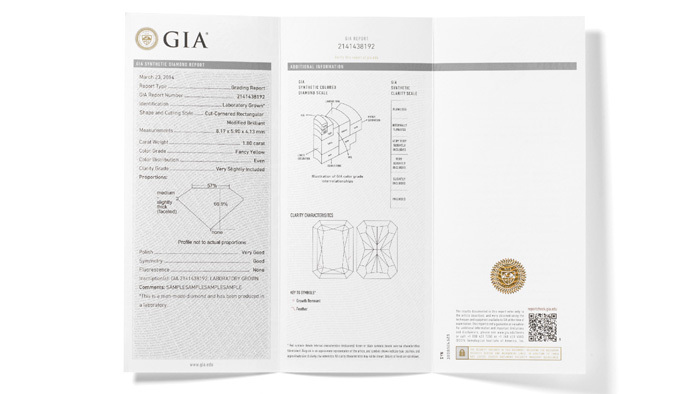 The GIA Synthetic Colored Diamond Grading Report provides the same information as the GIA Colored Diamond Grading report issued for natural diamonds, using a more general description of color and clarity. 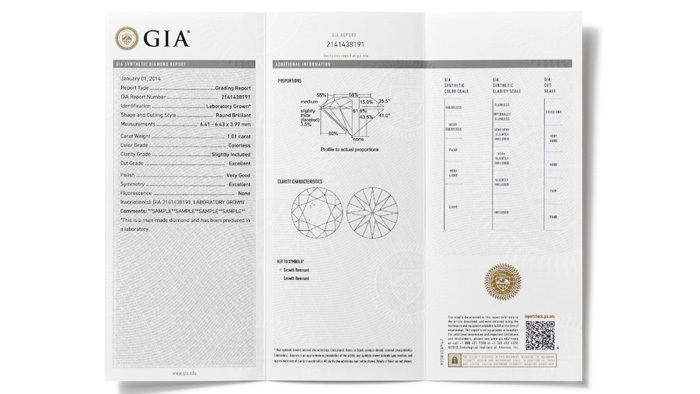 The GIA Synthetic Colored Diamond Grading Report offers the same information as the GIA Colored Diamond Grading Report issued for natural diamonds however, a more general description of the color and clarity is provided. 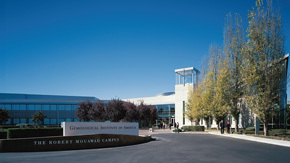 For added disclosure and identification, the synthetic diamond’s girdle is laser inscribed with its report number and a statement that the stone is laboratory grown. What’s more, the report itself looks distinctly different from those issued for natural diamonds. The laboratory issues synthetic colored diamond grading reports for loose, colored synthetic diamonds that weigh 0.15 carats or more. GIA Synthetic Colored Diamond Grading Reports are not issued for simulants, mounted synthetic diamonds or those that have undergone unstable treatments, such as fracture filling or coating. And while synthetic colored diamond grading reports may be issued for diamonds that have been laser drilled, this stable treatment is prominently disclosed on the report. The GIA Synthetic Colored Diamond Report describes a colored synthetic diamond’s color grade. The GIA Synthetic Colored Diamond Report describes the colored diamond color grade of a synthetic diamond. For added disclosure and identification, the synthetic diamond’s girdle is laser inscribed with its report number and a statement that the stone is laboratory grown. What’s more, the report itself looks distinctly different from those issued for natural diamonds. Both mounted and loose synthetic colored diamonds of any size can be submitted for this report service. The GIA Synthetic Colored Diamond Report is not issued for simulants, or synthetic diamonds that have undergone unstable treatments, such as fracture-filled or coated diamonds.